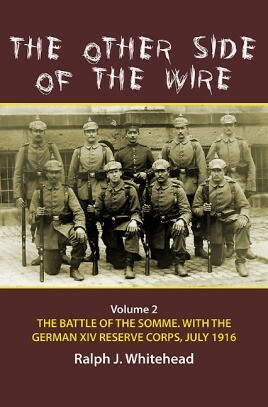 Volume 1 of 'The Other Side of the Wire' told the story of the German XIV Reserve Corps from the initial invasion of the Somme in Northern France in 1914 to the final hours before the momentous battle of 1 July 1916. Volume 2 covers the epic Battle of the Somme and takes the reader through the story of 1 July 1916 as seen from the German defenders. Each part of the great battle, from Gommecourt in the north to Curlu on the bank of the River Somme, is presented from the German perspective of the men who defended their sectors against the British and French offensive. The story of the Germans fighting on the Somme on 1 July 1916 is presented using first hand accounts and regimental histories to provide the reader with a part of the battle long ignored in most histories written since the war. Hundreds of illustrations of the men who fought on the Somme on 1 July are presented to the reader, many previously unpublished from the author's personal collection. Numerous maps provide additional details to help the reader follow the flow of action on that historic day. Perhaps the most unique aspect of the book is the presentation of the casualty lists of the units that took part in the battle as they were published in the weeks following the battle in the German 'Verlustlisten'. Never before have the German losses been identified and presented to the public in this manner. It is the hope of the author to provide the reader with the human face of the men in Field Grey who faced one of the mightiest onslaughts ever seen in history. By providing these details, illustrations and casualty details a true portrayal of the men who fought on 1 July on 'the other side of the wire' can finally be presented. This superb Great War title is being published in a strictly limited edition hardback run of 750 copies, each copy individually numbered and signed by the author. Ralph Whitehead is a graduate of C.W. Post College in Greenvale, New York where he concentrated his studies in 19th and 20th Century American and 20th Century European history. He is currently the head of a Fraud Investigative unit for a national insurance carrier and has enjoyed a 40-year career in the insurance field. He has been actively studying the Great War for many decades and has established himself as an expert on the German Army of 1914-1918 with a special interest in German casualties. He has been a member of several well-known Great War groups including the Western Front Association, The Imperial German Military Collector's Association and is a member of the Great War Archaeological Group 'No Man's Land'. He has been a contributor to numerous Great War books including the Pals series and the Battleground Europe series. Ralph was an historic advisor to YAP Films on their series 'Finding the Fallen' that involved Great War archaeology. He currently resides with his wife in the small village of Fayetteville located in the historic Central New York region. The village was named in honor of the Marquis de Lafayette following the War of American Independence. This is Ralph's third book, and he is already planning on future projects. "Helion has produced a first-rate book of the highest quality. Ralph Whitehead has written a book that is a critical addition to any aspiring military historian of a professional or casual background. This book is recommended in the strongest possible terms". "This book covers so much that it needs to be read by everyone who knows the Allied versions [of 1 July 1916] ... "